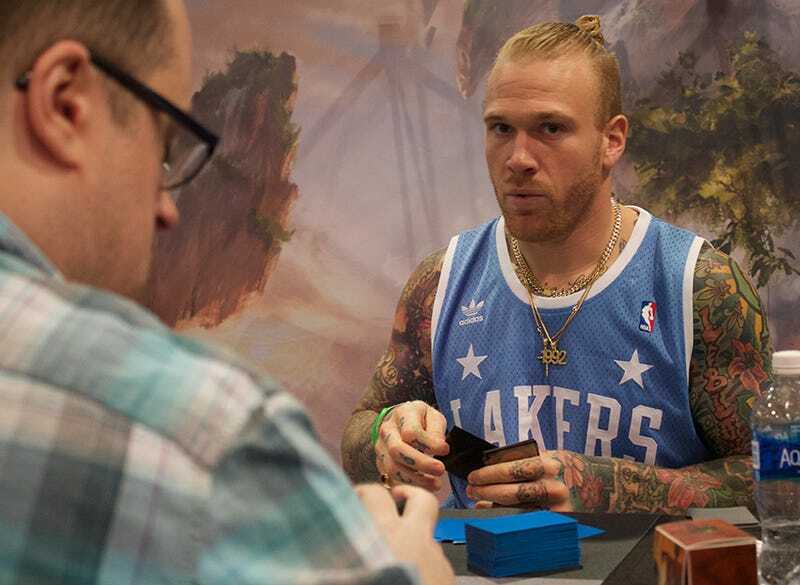 Cassius Marsh is known for tackling ball carriers as an NFL linebacker, but the Seattle Seahawk had an unlucky go last weekend playing another game he loves, Magic: the Gathering. Marsh was invited as a special guest to last weekend’s Grand Prix Las Vegas, a five-day Magic fest featuring Magic artists, vendors, cosplay, and three competitive tournaments. Marsh talked up his game, saying he is used to playing against “tier-one type guys,” but Saturday’s tournament sent him straight back to training camp. Marsh picked up the game in his middle school years, and though he’s played casually for over a decade, GP Vegas was his first large-scale tournament. Marsh was chosen to play his second round on camera in a feature match streamed live on Twitch to thousands of viewers. True to his football position, the linebacker piloted a controlling, defensive deck called Blue Moon; its strategy is to neutralize early plays and buy time until a superior endgame can be unleashed. Unluckily for him, he was paired against a player using Affinity, one of the fastest decks in the format, which quickly assembles an army of tiny robots that can synergize Voltron-like and grow out of hand. Though he had fifty minutes allotted to complete a best-of-three match, Marsh took a pair of L’s in under twenty. ...and here’s the concession and handshake for Game 2. Marsh’s final standings show a finish of 3,150th place out of 3,400 players, notching just one win over the course of the tournament. He didn’t seem to take his losses too hard— he described his weekend as “a blast”, and dropped a couple thousand dollars on new cards for his collection. Marsh is already a minor celebrity in the Magic world, and made waves in the community a couple times in the past year. In November, his $20,000 collection of cards was stolen from his car and never returned, though Magic’s Seattle-based publisher Wizards of the Coast gifted him a care package in consolation. When the holiday season rolled around, Marsh decided to give back, and along with Seahawks teammate Doug Baldwin played in a charity Magic tournament to benefit the Big Brothers, Big Sisters program of Puget Sound. In other Las Vegas sports news, Golden Knights center Reid Duke is still 16 times less popular than the Magic pro who shares his name. Editor’s note - June 25, 11:45am: Some readers of this article have complained about its tone, inferring that the intent was to mock Marsh’s performance. That was not our aim. Marsh’s unabashed enjoyment of Magic is admirable, and we’re fans of any blurring of the lines of so-called jock and nerd pursuits. Nevertheless, we now realize that whatever our intent, the piece comes off in places as mean-spirited. As such, we’ve tweaked the intro and another line meant simply to note the contrast between the two types of sports Marsh plays here. You can blame the story’s editors, not its author.